* TVS may not sell all the bikes listed here in all showrooms. TVS bike pictures are for representation purpose only. 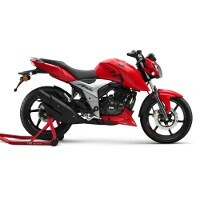 To book and know the on road price of any TVS bike click the buy now button. TVS MOTORS is considered as the flagship company of the TVS Group. In addition to it, the company is the third largest two-wheeler manufacturer in India. Being one among the top ten companies in the world, people all over India are familiar with the brand as it produces bikes for all classes and utilities. Its ever-growing customer strength and prolonged sustainability could only have been achieved by severely working towards customers' needs, catering to different sects and gaining a brand recognition amidst all classes. And they seem to have utilized their key strengths to the maximum. Already Own a TVS two wheeler? Come on tvs u all got to get this bike, in all these years never was a proper dirt bike ever for the masses at an at least affordable prices with such a beautiful engine, pls bring it on tvs the boldest of the two Wheeler company in india. Perfect bike for city trafic and off roads, launch it before Royal Enfield Himalayan 410 cc comes. i prefer 300fx over re-himalayan anyday.This says everything. A VERY WARM WELCOME TO TVS RTR 300 FX, AHMEDABAD FIRST THEN REST OF INDIA. sir, i need to clarify the hyper edge external design in Appache RTR 160 same as design in Appache RTR 160 FI ? In market Appache RTR 160 FI is available are not ? I need to get this bike on next month and not compromise with appache 160 design if it varies with Appache RTR 160 FI i shall prefer it, Otherwise i will go with Appache RTR 180.